Grand Central Life & Style, 9781455596713, 304pp. 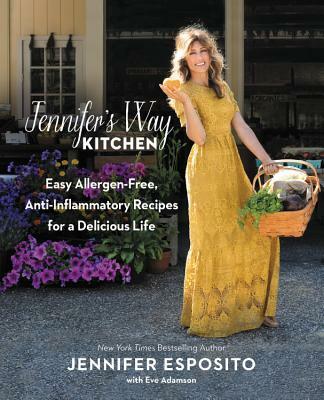 Jennifer Esposito, actress and owner of the beloved New York City-based Jennifer's Way Bakery, shares 100+ delicious, anti-inflammatory, allergen-free recipes that will help bring the joy back to eating for everyone. Crunchy pizza, warm toasted bread, soft chewy cookies-who doesn't love them? Do they love us back, though? Jennifer Esposito, health advocate, actress, and creator of Jennifer's Way Bakery, says they can. Clean, simple food is all we want or need. But how do we eat deliciously, not feel deprived, stay healthy, and beat the dreaded inflammation that plagues us all? The Jennifer's Way Kitchen cookbook is the answer everyone has been waiting for. It's full of easy-to-follow, mouthwatering recipes that will reduce inflammation-which is the single best thing anyone can do for his or her body. The goal is to change the way you think about food. An avocado turns into a decadent chocolate mousse. A delicious, crunchy loaf of bread is made without any grains or allergens. And a head of cauliflower turns into that decadent pizza you thought you'd never have again. Whether you're a food-allergy sufferer, a celiac, someone looking to improve their health by beating inflammation, or just a lover of good healthy food, this book is for you. So let's get into the kitchen and take back your health. Jennifer Esposito is an award-winning actress who has appeared in numerous roles in film, TV, and on stage, from Academy Award Best Picture-winning movies to network television hits to acclaimed cable dramas. She is the owner and CEO of Jennifer's Way Bakery in New York City, and the author of the New York Times bestselling memoir Jennifer's Way.